The Kuching Waterfront Jazz Festival 2018 will be happening on 28 – 29th September 2018. Last year, the organizers hosted 4,000 people at the festival, so the numbers are likely to soar this year with a stronger line-up. If you’ve noticed any hick-ups during the first one in 2017, it should be ironed up this time around. The festival itself hasn’t changed much in terms of concept with a lot of buzz happening during the whole two day event. The Kuching Waterfront Jazz Festival 2017 had the likes of Sheila Majid last year. Shiela Majid is a huge name in jazz, so topping last year would not be easy. Thankfully, this years line-up is equally impressive with Sarawakian Dayang Nurfaizah being one of the biggest names to perform. The local Sarawakian joins the likes of Jolynn J Chin, TOMPI, Carmen Souza Trio, Aisyah Aziz, Blues Gang, TULUS, Alemay Fernandez & Richard Jackson, Atilia Haron and Natalie Gillespie Band on stage during this two day festival. Other acts also making an appearance on stage during the Kuching Waterfront Jazz Festival 2018 are Aditya, Natalie Gillispie Band, Tuku Kame, D’Cipta Band and the winner of KWJF2018 Jazz Band Search which is Sang Voyage. The line-up is very favorable and exciting for Jazz fans as they are huge names in the scene. 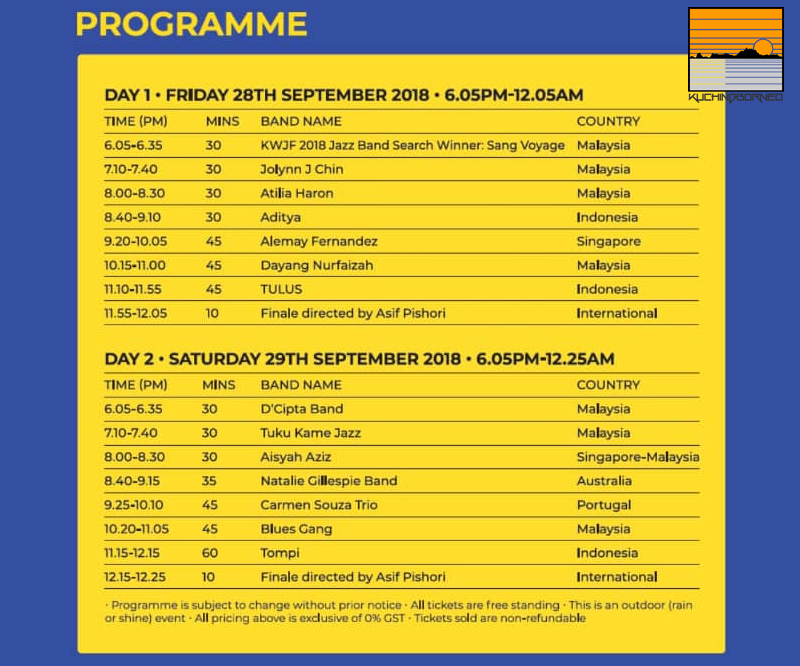 I’m not exactly a jazz fan, but having the likes of Dayang Nurfaizah and Tuku Kame in the mix is good enough to have me eager to go to the festival. On 28 August, I received the full schedule of the Kuching Waterfront Jazz Festival. You can check out the schedule below, or download it if you want to. The food bazaar at the Kuching Waterfront Jazz Festival 2018 is tiny compared to the signature Kuching Festival, but it is the only fixed event in Kuching at the moment that has the enigmatic Kuching Waterfront as a backdrop. Last year, there was about 10 food stalls serving local and international food, and I was informed this is set to increase given the reception at these food stalls last year. The Kuching Waterfront Jazz Festival 2017 at night. The crafts and arts bazaar is a mixed bag with NGO’s also joining in to raise funds for their purpose. Expect to see hand made crafts, and also exclusive crafts and souvenirs at the festival. By the time this preview is up, the promotional prices offered for the festival had already been closed. However, there’s still pre-purchase tickets which are so much cheaper than the ‘at the door’ tickets. You can pre-purchase your tickets at www.kuchingwaterfrontjazz.com. 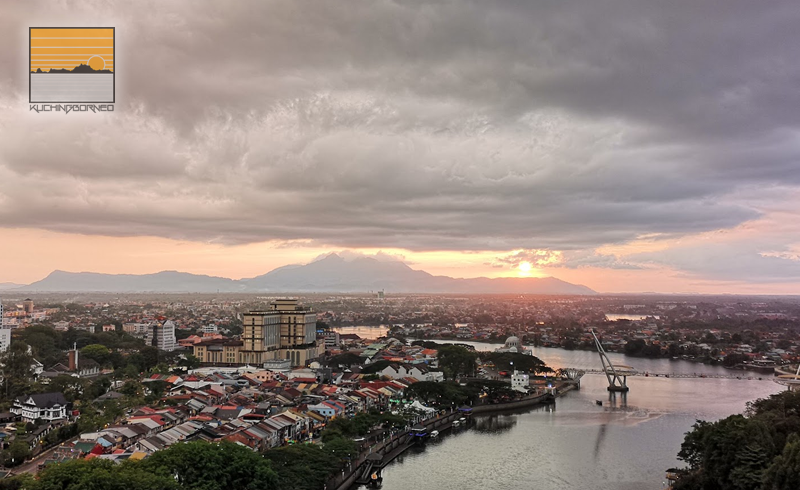 The Kuching Waterfront Jazz Festival 2018 will be played behind the Grand Margherita Hotel, on the Kuching Waterfront itself. Thanks to it’s popular location, going to the Kuching Waterfront Jazz Festival 2018 wouldn’t be difficult. 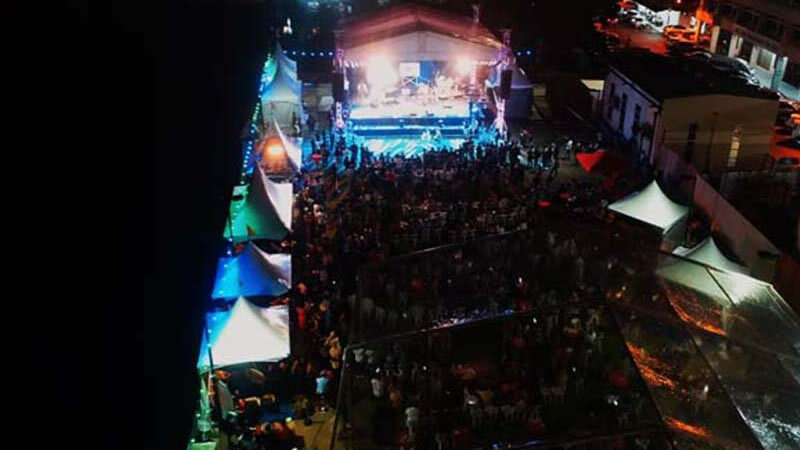 It is likey the Kuching Waterfront Jazz Festival 2018 wouln’t be so visible from the front of the hotel as the festival grounds is located behind the hotel, hidden from the main road. WHERE TO STAY DURING THE KWJF 2018? The Kuching Waterfront Jazz Festival 2018 kicks off What About Kuching (WAK) 2018 which is yet another signature event in Kuching. If you want to know more about WAK 2018, I’ve wrote about what to expect in the event through this article. P/s: I will update this post from time to time, so bookmark it to get the latest details on the KWJF 2018! – Last updated 28 August 2018.